The Chinese slang term jingfen means "spiritually Finnish." 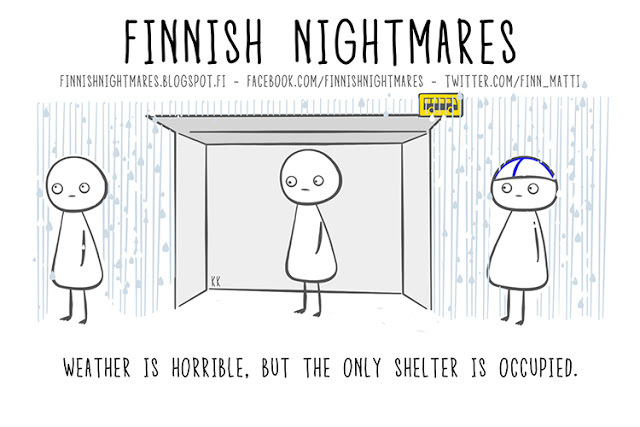 It was coined thanks to the popularity of an online comic called Finnish Nightmares. Liang Chenyu speculates why so many Chinese millennials identify with the comic. The creator of “Finnish Nightmares,” artist Karoliina Korhonen, says she is surprised by its popularity among Chinese millennials. “I thought Chinese people might be used to crowded places,” she writes in an email reply to Sixth Tone. Korhonen thinks jingfen is a fantastic buzzword. “I said once that everyone can have a little bit of [the comic's protagonist] Matti in them, regardless of where they are from,” she adds.